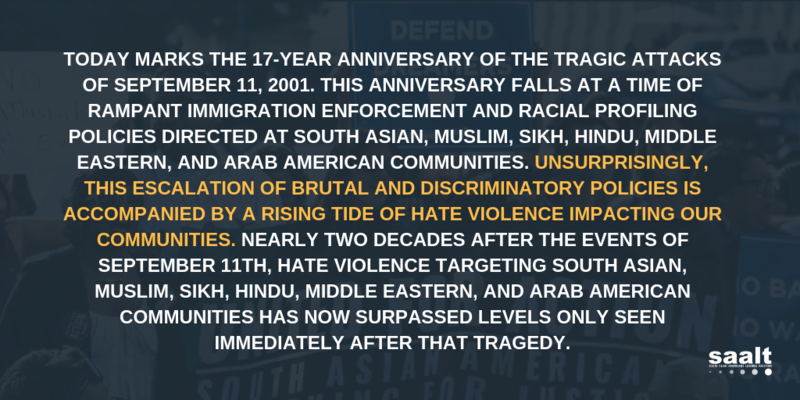 SAALT’s strategies include conducting public policy analysis and advocacy; building partnerships with South Asian organizations and allies; mobilizing communities to take action; and developing leadership for social change. SAALT’s programs are grounded in our guiding values that stem from a view of the world that is based on social change and social justice principles. Engage in national level policy advocacy focused on hate violence, immigration, and civil rights and liberties, informed by our work and experience at the community level. Build community power by partnering with and strengthening the capacity of NCSO organizations (and candidate organizations for the NCSO) to impact state and local policy. Maintain crisis and rapid response capacity where critical gaps exist, and in service of advancing our communities’ priorities. Conduct analysis and gather evidence on the challenges and the public policies that affect South Asians. Articulate a communications strategy to amplify SAALT’s brand and impact and shift national discourse about our communities.